Import and generate thousands of coupons per shopping cart price rule literally within seconds. Export coupon codes for your affiliates. View coupon usage statistics. Start Groupon deals. Generate and Import Coupons tool allows you to easily create and apply a wide variety of discount promotions and sales on your site. Motivate your customers make more advantageous purchases. 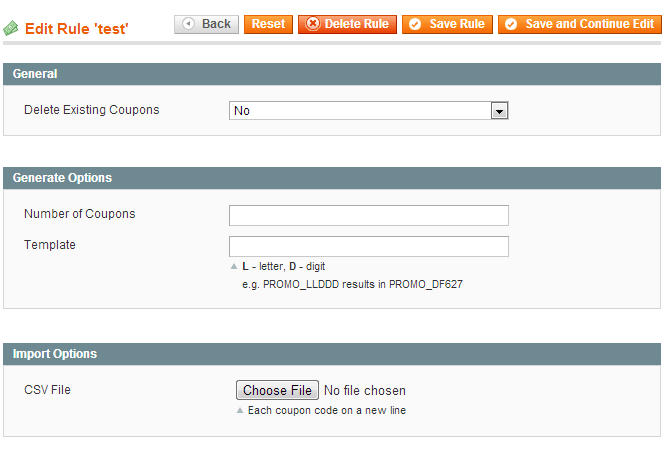 Generate and Import Coupons is an advanced version of the Wildcard and URL Coupons module. This is very convenient, as you will not need to create the same rule many times just to have multiple codes for it. Create as many couplon codes as you wish for one shopping cart price rule. Our Magento 1 coupon code module supports this feature starting from Magento CE 1.4.2. Take advantage of the Magento 1 coupon code generator tool. The coupons are generated based on templates that you create. You can use a separate template each time. Generation algorithm will replace 'L' and 'D' symbols used within the templates with random letters and digits. You can generate thousands of coupons in one go, as we did while testing the extension, and it would take just moments. 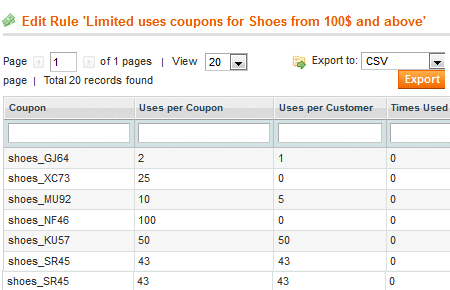 Generated coupons inherit values of 'Uses per Coupon' and 'Uses per Customer' parameters from the main coupon. Import unlimited number of Magento voucher codes from a CSV file. Now if you host deals on websites like Groupon, you don't need to create thousands of shopping cart price rules- it took a couple seconds. Imported coupons inherit values of 'Uses per Coupon' and 'Uses per Customer' parameters from the main coupon. To download an example of a CSV file click on the button below. Groupon requires its partners to provide coupons usage report including shipping tracking number. Now the module enables you to generate and export such reports into CSV format. For your convenience, it is possible to filter coupons by a certain groupon shopping cart rule to get usage information only for a particular promotion. 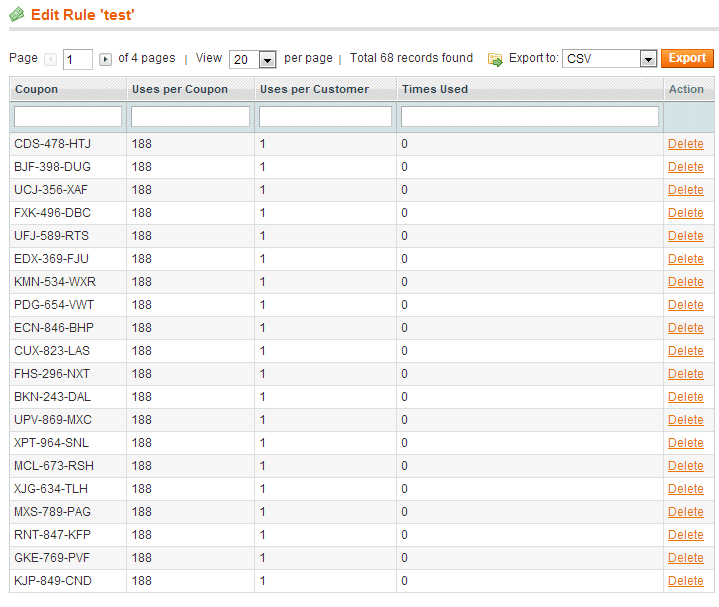 Also you can filter the report by order ids, coupon codes, shipping tracking numbers and other data. Coupons usage report works both for manually added coupons and imported ones. You can also export Magento voucher codes. The output file will contain not only the coupon codes themselves, but also values of 'Uses per Coupon', 'Uses per Customer' and 'Times Used' for each code. You can provide this information to your affiliates and/or sales representatives, who in their turn can distribute the coupons among the customers. With the help of the extension you can easily create links like http://example.com/landing-page.html?coupon=XYZ-987, by clicking which customers will get coupons applied automatically. This will work great for promotional banners. Also you can place the discount code Magento links on your affiliate sites, so that your promotions attract a much larger audience and you get more profit. The extension uses optimized queries and therefore coupons are generated and imported very quickly. Amaze your customers with the ability to apply multiple discount coupons to one order and make their shopping process more comfortable. With the help of the Multiple Coupons extension you’ll easily set the appropriate number of coupons for any item in your store incentivizing clients return to your shop and make more purchases. Exploit the magic power of coupons to the full! Show your care and attention to customers. Send them coupons on special occasions, such as birthday, or just to praise them for registration. The Special Occasion Coupons module allows you to easily create various types of coupons to dramatically increase customer loyalty. Try also our Facebook & Twitter Promo extension to expand your promotional possibilities. Motivate new audience to join your social media community and raise your conversion rate. Please watch Generate and Import Coupons video review to find out more about how the extension works. Yes, you can create coupons for a specific product/ brand. You may use various conditions in the Conditions section of the Cart Price rules to apply the rule to a needed brand or product. Read on to see a screenshot. Yes, you can assign a coupon code for a specific customer group by making changes on the coupon settings page in the customer groups tab. Go on reading to see more instructions. Is there a maximum of coupons you can import? The number of Magento unique coupon codes that can be imported with our module is not limited by the extension settings. However, there may be certain restrictions caused by your web server: a maximum file size, maximum server timeout, PHP script timeout, etc. Can I restrict uses per coupon code? Yes, you can choose how many times a discount coupon code can be used. Can I restrict uses per customer? Yes, it’s possible to set a number of coupon codes uses per a customer. Yes, our Generate and Import Coupons module can do that for you. It will enable you to create links like example.com/landing-page.html?coupon=XYZ-987, by which you can send a coupon code to a customer. We have been using this extension for ages and everything worked well. I'm taking one star for the lack of updates and new features. When you pay for support and updates you expect that new features will appear through the years. But again in overall we never had any issues with the extension and support in overall. We are using several coupon systems at present - Groupon, Living Social and Amazon Local. But it was obvious since the beginning that we couldn't generate thousands of coupons each week without any automatic process solution. So we started looking for such decision right after signed a contract with the first coupon site. We’ve tried several extensions during last three years. But I must say that this one is the best. The installation passed without any issues. Everything works as it should be. And the biggest plus is of course excellent support team which is always ready to help. Thank you guys, keep up working! Works out of the box without any issues. We have been using this product in our Magento shop since 2014. There are absolutely no issues what so ever and it works like a charm. Additionally, Amasty's customer service and technical support are simply the best. 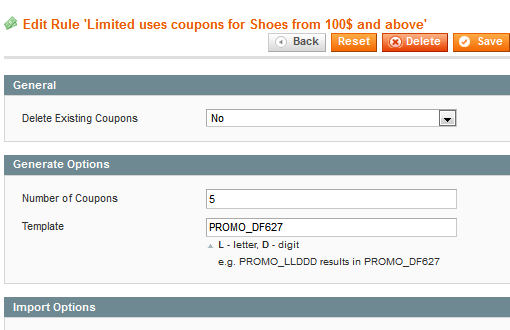 Anyone searching for the coupon related Magento extension: look no further, get this extension. I would definitely recommend this product. Before having chosen amasty plugin for our retail store we spent a couple of days browsing through countless coupon addons. Actually it was a shot in the dark, as all developers claim their plugins to be the best from the best. This one appears to be a real catch! It saved us from groupon nightmare allowing import 4k+ coupon codes very fast. Works on our Magento 1.9 pretty good. I’d definitely recommend the plugin to everyone dealing with groupon like sites. I am completely entry-level Magento user and I have researched a lot before choosing this tool for my Groupon deals website. So, nine months gone and now I can draw some conclusions. The extension works out of th e box. I’m very delighted cause it enables me to sell both coupon based deals and regular product deals. Moreover it enables me to import more than a thousand coupons with no efforts. The customer support is top-notch. I reported two issues, and it took less than 24 hours for them to help me. This is worth spent money. Works as described. We are using coupons for affiliate mapping to check where the sales are coming from so we need a bunch of codes. The customer service also responded within several hours. I'm really glad I've found this module. It easily allows us create unlimited number of coupons perfectly promoting our products. Our company was running a groupon campaign and we needed to import about 8000 codes FAST. This plugin was a straight forward install. This coupon addition is just excellent for importing. I highly recommend this plugin if you're in a similar situation. I've been looking for a mass coupon creator and this extension seems to perform its tasks pretty well. Since we've installed it we've never had any issues with any features and we'e totally satisfied with its quality. How to make "Coupons via URLs" work? I had some troubles at first because other module was conflicting but Amasty offered me a great alternative! Don't miss the chance to make your store administration perfect! Thank you so much - this is exactly what we were looking for! Amazing module and support OUTSTANDING! Easy to to use! TIME-SAVER and worth single penny. It has been a pleasure to deal with this guys! Clean code that is worth the money. Been looking for something to do this for a month! This worked flawlessly with my post affiliate pro coupons so now I can import 1000s of coupons with little effort easily. We were worried this process would take weeks and this solved all of our problems. First extension I have used that didnt give me a headache of issues to get around as well. Seriously worth the money will look into their other extensions as well soon as they appear to be good and clean coders. I hate when I buy an extension that I pay for and have to fix or contact support about. This was nothing like that. Perfection and well priced. Only thing that could make it better is if it were free heh. Thanks to Alex for awesome solutions. Alex, thank you. You have always stepped far above and beyond and it is deeply appreciated. Extension functionality is great, as well as support! This extension to import coupon is what we expect. Job is perfect done. Amasty is very helpful and very efficient. This guys help us during a deal and find the problem in a couple of hours only. Very sympatic too, I definitely recommend Amasty. We use Generate and import coupon extension on www.stortle.com. From 2 month, we test it with 10 thousands coupons with no problem. We love it. Works great for groupon deals! I must say that this module made life easier when you work with groupon. We had a big thought how to resolve importing 3000 coupon every week from groupon, and this module really made the job. Alex also give fantastic support if you have any question. Tested on Magento 1.5 and 1.6 and it works on both. Small tip: If you get 3000 codes from groupon, in an excel sheet, and wonder how to convert them to "," separated, do like this. Great extension and must have for any store if dealing with any coupon sites such as groupon. Bought a few extensions from amasty and they always provide excellent results. This is an excellent module, very easy to install, good clear documentation. The coupon usage report is also really good. Highly recommended. We needed a way to import about 8000 codes for Groupon fast as our campaign was actively running and they provided the codes to us late. This plugin worked perfectly for this. We were able to import all the needed coupons without issue. The way their addition is added to the already existing coupon section makes the process very straight forward. The only note I should make is that if you're doing code specific coupons (as we were) and importing a bunch, whatever you entitle the primary coupon "specific code" will also be a coupon so make it something hard to guess since you won't actually be using this one. Installation of this plugin was very clear and straight forward. It only took a couple of minutes and the directions were very clear. Highly recommend to anyone in a similar situation of importing coupons. Excellent module, easy to install with the clear doc. A life saver for bulk coupons. Great support! just installed, tested and works like a charm on 1.5. Good job except that Groupon are now changing their system to take orders directly on their site and export the orders with coupons to your site and then send them back a coupon usage report to claim commissions etc. There doesn't seem to be a way to import orders with coupons using the "coupon" field...? Great Extension! Works as advertised with no issues. Plus their customer support is great! It's true to description. Just watch for upgrade costs. I've been using this module for little over a year now and I have to say that it's extremely easy to install and configure. It's made using pre-generated coupon codes from systems like Living Social and Amazon Local a breeze. I've only ran into one issue and it was with Amasty's upgrade/maintenance release policy when magento went from 1.7 to 1.7.0.2. Since I was outside of the 6 month purchase date I was forced the purchase a dot release (maintenance release) from them to get it to work with 1.7.0.2, even though it worked in 1.7.0.0. The extension totally broke and would not work after the mag upgrade. I can see charging for version upgrades, but it bothers me a little when they charge for a dot maintenance release to get the extension to work with a dot release of mag. If mag is a dot release and all they do is a dot release to get the extension to work again, they should provide that fix free of charge. But if it's a full rev release from mag like 1.7 to 1.8 then yeah I can understand the recoding and purchasing an upgrade. I just have a problem with someone charging for a maintenance release to fix a bug that prevents it from working from a minor dot release to another. But overall, the extension does make life much easier when dealing with deal site coupon codes. Perfect! 1 minute for installation, 2 minutes to learn, 500 coupons generated in 7 secs. What else can we want? great tool and great support! kind regards! – Tested with the latest Magento CE 1.9 release. – Denies applying of multiple coupon codes from one shopping cart rule, if Multiple Coupons module is not installed. – Coupons usage report with possibility to export it.